Jio 4G LTE is so many popular in all over India only few months. Nowadays so many jio users available in town and village. 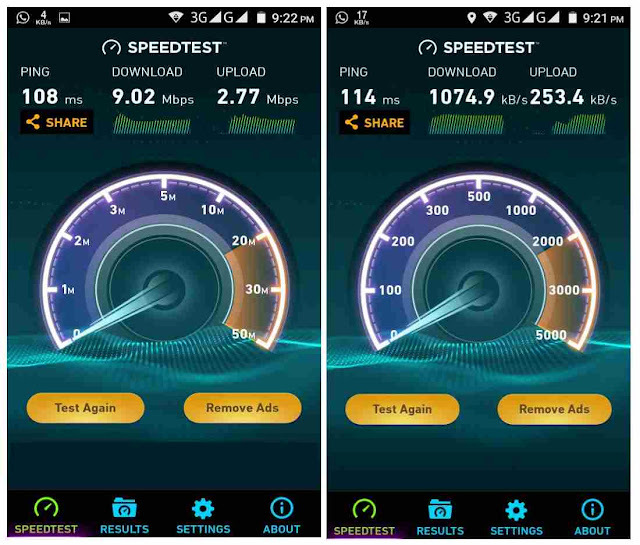 In this post I want to try to give Jio 4G LTE speedtest result and its download review. 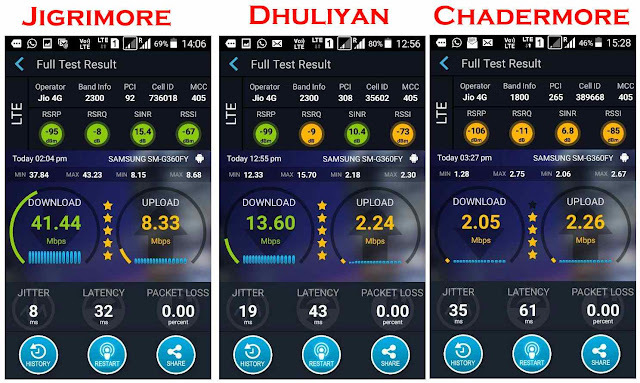 Currently three telecom operators providing 3G services in Nalhati, Birbhum, West Bengal, India. These are Vodafone, Airtel and Reliance. But nowadays we get jio 4G available at here. Source of this data : Today I get one LYF wind 4 handset and I on its hotspot then connect my laptop. Then I get speedtest result and I try to download some songs, videos. Then I saw 20MB trailer download from youtube and its done by 5seconds. So the actual download speed is 4mbps. But when I try to download through IDM(Internet Download Manager) then I get 2mbps download speed. Currently three telecom operators providing 3G services in Farakka, Murshidabad, West Bengal. These are Vodafone India, Airtel and BSNL. All the operators provide good quality coverage all over Farakka. But nowadays one telecom operator providing 4G service is available at here and almost all over India. The download speed is more than 10mbps every time. When I try to download movie on u-torrent then I get download speed more than 4mbps. When I saw youtube or online video then its picture quality is awesome with out buffering. 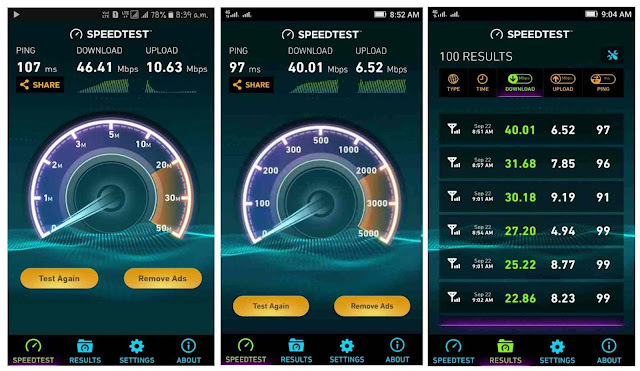 I was going Farakka on 15 August in 2016, Then I have got my friend's Jio 4G through YU Yuphoria smartphone then on the hotspot and connect through WiFi my Micromax Canvas Spark. 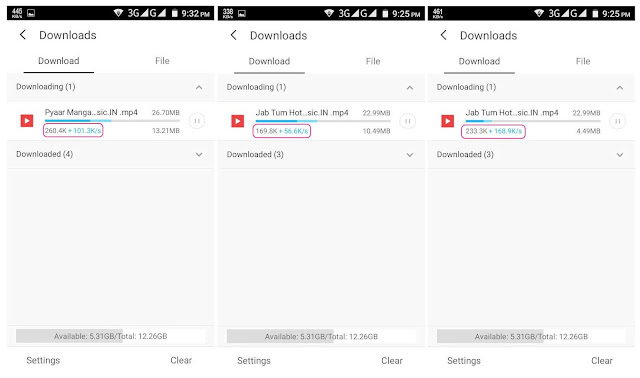 Speedtest review : I try to download some videos on my handset through Jio 4G then I get download speed 250kbps to 400kbps but when I try to download an app then I get 1mbps download speed. Sometimes it have very good speed but average speedtest result I saw 15Mbps. There video calling quality is great, I saw full HD picture and good sound listening. 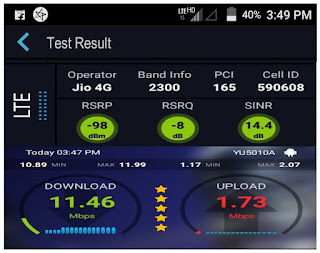 Note : In this post I want to speedtest results of Reliance jio 4G LTE so many areas. When I get some others areas speedtest result (speedtest photo prove) then I post that in this post.